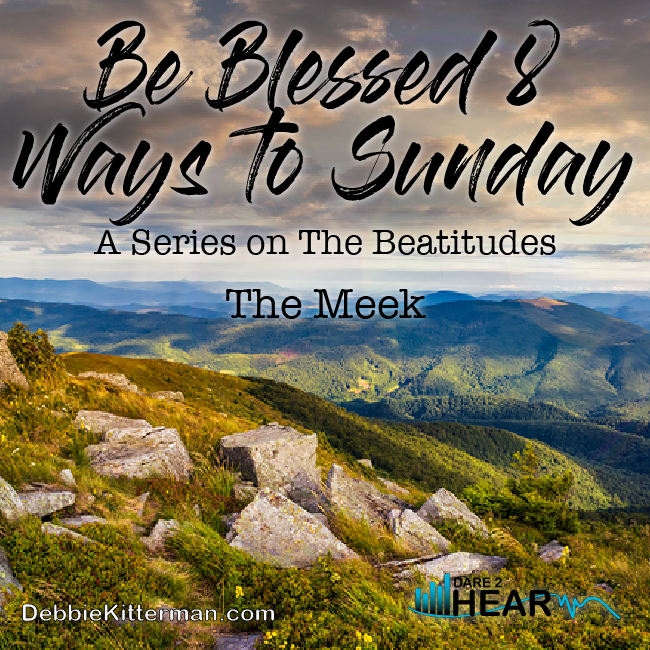 Welcome to week four of my series on The Beatitudes. 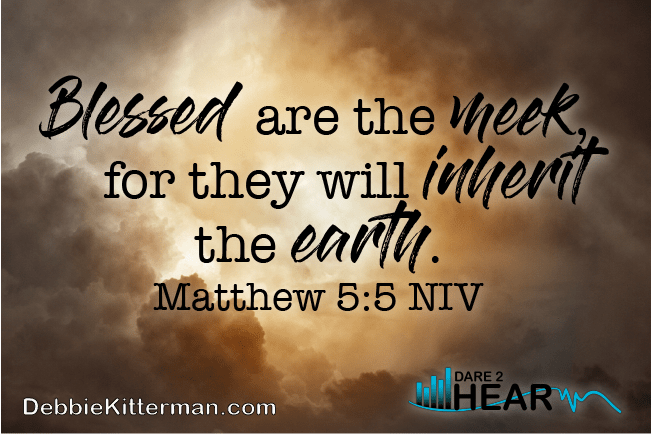 for they will inherit the earth (Matthew 5:5 NIV). Have you ever heard someone say that Christians are wimps? That they have no backbone, are weak and vulnerable and are doormats for everyone to walk on? There are those in the world who think meek people are doormats, and that being meek is somehow associated with someone who is passive and doesn’t do anything to take a stand. Meekness has also been defined as unassuming, unpretentious, easily managed, or handled. Maybe you have bought into what our culture has taught? We have to look out for ourselves and take care of ‘ole number one because no one else will. Society has taught us that being meek isn’t a good thing. We’ve been taught that those who are meek are weak and are no good to anyone. Our modern-day culture has taught us that to be meek means to not just be weak, but to be vulnerable, timid, quiet and unresisting or a victim. In light of what our world teaches, let’s be honest. Do you like the idea of being meek? Does Jesus really want His disciples to be vulnerable, victims, weak and timid? No, of course not! Can’t you just hear the Holy laughter from Heaven? We need to recognize that the Kingdom of God often runs counter to the culture of our world and its standards. Jesus taught that to be the greatest you must become the least. (Matt 23:11) When Jesus said “blessed are the meek” he was not saying, blessed are the weak, timid, vulnerable… etc. In order for us to fully understand, accept and embrace what Jesus was talking about, we need to fully understand the definition of meek and what it meant here in the original language. According to the dictionary meek means: quiet, docile, gentle, spiritless, and easily imposed on; submissive. These words the dictionary uses to describe meek are not all bad, but the world does look at a person who is “meek” as having a character flaw or deficiency and therefore an easy target. However, the word “meek” in the Greek, is translated praeis and refers to: mildness, gentleness of spirit, or humility. Biblical meekness means to walk in #humility . … walk holy, in a way that is suitable to your high rank, given to you in your divine calling. With tender humility and quiet patience, always demonstrate gentleness and generous love toward one another, especially toward those who may try your patience (Ephesians 4:1-2 The Passion Translation). In the Old Testament story found in Numbers 12:1-9, we see a good example of what it means to walk in meekness/humility and what it means to be filled with pride and self-importance. In these Scriptures we see Miriam and Aaron begin to talk against and bad mouth Moses. Meekness is the power to absorb adversity and criticism without lashing back. Moses was considered a meek and humble man. He did not have a “me first” attitude, instead he had an “others first” mentality. He didn’t lash back or criticize his brother and sister, instead the Lord took care of that. praeis means more than “meek.” Biblical meekness is not weakness but rather refers to exercising God’s strength under His control– i.e. demonstrating power without undue harshness. Here in Psalm 37, we see almost the same exact words Jesus spoke in Matthew 5:5. Having an attitude of meekness would not have been a new thing to the disciples and those listening to Jesus that day. In the original language which Jesus would have been speaking “meekness” meant to walk in humility and have submitted strength. Submitted strength simply means to allow God control over and in our lives. Biblical meekness allows us to say: #Jesus, I trust You to take the wheel of my life. When we walk in Biblical meekness we are saying: “Jesus take the wheel” of my life. I trust You to order my steps to go where you need me to go. Biblical meekness is about letting go of the “I want it my way” mentality and being obedient to God whether He says stop, no, or go. “You’re blessed when you’re content with just who you are—no more, no less. That’s the moment you find yourselves proud owners of everything that can’t be bought.” (Matthew 5:5 MSG). Your thoughts on meekness were thought-provoking. I had never heard of the Greek translation or the term “praeis” before. Thank you for opening my eyes to a new understanding of one of the beatitudes! Thank you Laurie- they definitely sparked some thinking and discussions in my household. You are most welcome for sharing what I found and expanding you into a new understanding. You are most welcome Maree! It does take on a whole new and sometimes different meaning when we go to the original language, doesn’t it. I am glad what I shared is helping others to understand these verses more. Just found your Thursday link up through another blogger pal. Thank you for hosting.and I will be sure to hop around. This post makes me want to dig into my old MP3 player and find Piper’s sermon series on the Beatitudes. I love this passage of Scripture and as one who is not naturally meek, I’m thankful for the work of the Spirit! MEEK NOT WEAK. I remember that description of Jesus all the way back to my Sunday School days! It’s such a good description isn’t it!? I don’t ever recall people saying it in Sunday School, but it’s a good one! Good word Debbie! The world often looks at meekness as a bad thing. I love the quote you mentioned by Tozer. To know both that we are nothing without Jesus, but everything with Him is crucial! What a great series, Debbie. The beatitudes are rarely addressed. I remember a time when I completely misunderstood meekness as a weak character trait because so many have used it as that. This humility aspect is such a strong and noble character trait. You are most welcome Katy! I am so glad you are here today. I also really liked that definition… not one I had ever thought about with meekness, but totally fits perfectly… especially when looking at Jesus’ life and ministry. Debbie, how interesting the contrast between the greek versus modern definitions of the word “meek.” I like that; thank you for sharing it. I love the Psalm verse that says the meek shall inherit the earth. That seems like a far cry from vulnerable to me! 🙂 Thanks for this good word today, friend. I’m glad I found your blog! I love that you use a variety of quote from both the bible and other sources. I love quotes too! So much wisdom if we choose to seek it.. I like your definition of meek. I don’t think we should be doormats. And the John Piper quote resonates, I am trying to just that. Thanks Rebecca – I agree – just say no o being a doormat! I am glad John Pipers quote resonated with you. Thanks for being here today! You are most welcome Marilyn! Thanks for being here – I am looking forward to trying the cucumber and onion dish! Very interesting. You proved my theory because I have always thought that people who seemed meek were the strongest. Thanks for hosting and I hope that you have a wonderful weekend. I am glad that I was able to confirm your theory! Have an awesome weekend! Such a great post on meekness! It’s good to be reminded of the true meaning – gentle, humble, not the negative label (weak, pushover, wimp) that society places on the meek. Thank you! Malika – welcome! Thank you so much for your encouragement about my post. while researching and writing the post, I too found it a good reminder for me about the true meaning of meekness which of course is contrary to the worlds view. Blessings and thanks for being here today – enjoy your weekend. Love this Debbie. I want my childhood meekness back (or maybe a fresh dose) from the Holy Spirit. Somewhere after having three littles I feel like it went out the door. I need this in my life. Thanks Meg! I am so glad to have you stop by, that means you must be feeling better 🙂 I know what you mean by needing it back after having kids… I am sure that it will come rushing back in the door, the minute you ask Jesus to send it your way. So appreciate you being here. The Holy Spirit just gave me a fresh insight on something He’s already been speaking to me through your post today. Thank you! Oh Elizabeth – I love that the Holy Spirit gave you fresh revelation as you were reading my post. Thank you for sharing that wonderful news with me. 🙂 Go God! Debbie, I LOVE this. Meekness is a word and concept so dear to me, and I’ve been praying for more meekness in my life. Thanks for the wisdom! Sharing!! I did a study on this verse a few years ago in preparation for a class and discovered the subtleties of what meek means as well. Add so much to the understanding of the verse. thanks for sharing your insight here. The Holy laughter! I can definitely hear it ;). I completely agree that people don’t fully grasp the beauty behind true meekness. Thank you for properly defining it here for us. I absolutely love your thought that it’s saying “Jesus take the wheel.” I definitely need to express those words more. Thanks for the reminder!